Afghan National Army (ANA) soldiers arrive at the site of gunfire and attack in Jalalabad city, Afghanistan, July 11, 2018. A pair of heavily armed suicide bombers Wednesday stormed an education department office in eastern Afghanistan and killed at least 11 people. Witnesses said the assailants fired indiscriminately at staffers inside the building in Jalalabad, capital of the eastern Nangarhar province. A provincial government spokesman, Attaullah Khogyani, told VOA the attack injured 17 people. He said shortly after the siege began, Afghan security forces surrounded the compound and rescued 20 people before the nearly four hours long assault ended. There were no immediate claims of responsibility. 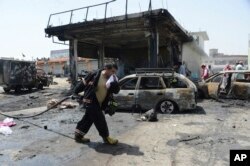 Tuesday, a suicide bomber blew himself up, killing 12 people at a security check post in Jalalabad. Firefighters work at the site of a deadly suicide attack in Jalalabad, the capital of Nangarhar province, Afghanistan, July 10, 2018. Islamic State’s Afghan branch, Khorasan Province or ISKP, claimed responsibility for the attack and also released a picture of its purported suicide bomber. The Middle East-based terrorist group also took credit for the July 1 suicide bombing in high-security zone of Jalalabad that killed 19 people, mostly members of the minority Sikh community. Nangarhar is located next to the country’s porous border with Pakistan and several of its southern districts are referred to as ISKP strongholds from where they plot and stage terrorist attacks elsewhere in Afghanistan.